Rub Some Bacon On It! : I'm no Bacon Noob! 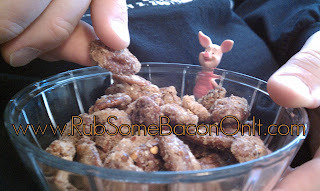 Just in case you get the impression that I'm new to the bacon craze, here's a link to my runner-up entry in Instrutables.com's 2011 Candy contest: "Candied Pig Nuts" are a snack candy that contains candied pecans with real crumbled BACON! Click the Pic to "Biggie-Size" it.